They ALL use the same online club/ event registration software; e-RegisterNow. Founded in Toronto, Canada, e-RegisterNow has been catering to the online registration service needs of thousands of companies, over the past 18 years. We’ve been there aiding companies behind the scenes looking for methods for: selling tickets online, camp software, online event registration, online member management tools, and much much more. Companies have been amazed by all that can be accomplished through our powerful online event registration system software. It just so happens that yacht and sailing camp/ clubs are one of our specialties! Throughout the years we’ve delivered nothing but exceptional experiences to our Yacht and Sailing clients, and we want you to be apart of the fun. A part of why we appeal so much to clubs, such as yourself, for online sailing registration software, is because unlike traditional registration systems, we make your page represent YOUR club and not our brand. With e-RegisterNow, your registration pages are designed for you, and customized to suit the overall look and feel of your website. *Here we’ve made The Royal Canadian Yacht Club’s registration page look as if it’s part of their very own website. However, take notice at the page’s URL. We give you all the power and WE DO ALL THE WORK! Our powerful registration forms allow for full customization, with hundreds of switches to help improve and customize your overall user experience and provide a tailored fit to your needs, designs and most importantly your club. Not to say that our online sports registration software is complex. Merely, upon first glance it can seem overwhelming to inexperienced users, due to the sheer amount of raw capability we have to provide your prestigious yacht or sail clubs. Once the camp registration software is turned live, your registrations will start to flow. At this point, our designers will offer you cashier training. Showing you first hand, in-depth how to print reports, make cancellations, monitor the flow of registrations, and everything else concerning navigating through the software. Whether you operate a small recreational camp or large prestigious club, e-RegisterNow has the tools to make your registration process run efficiently and smoothly year after year. We understand that each client is unique and needs to deploy the right registration tools at the right time. An intial kick off meeting at the beginning of a new client relationship, gives both sides an opportunity to bring forward the unique nature of the club and its entire online registration and sailing club management system(s) needs. Our highly skilled team will set up everything for you. From designing your registration forms to building the events, while you focus on what really matters to you… your club. Throughout the years we have designed switches and developed solutions around issues; some of which have been designed specifically for our yacht and sailing summer camps/ clubs and clientele. *NEW: Waiting List Feature. For popular events that sell out quickly. Supports the InGo.me, advocates via social media widgets. InGo functionality can be turned on with a switch. Optionally offering a Family Portal Based Login Approach. Dynamic pricing options, payment plans, early bird discounts, coupon discounts, promotional codes. The CAMP WALLET can dramatically save money on VISA/MC fees. Ability to display the number of remaining places left in each camp (click on Camp Registration tab). An easy to read grid of dates and camps. Include legal forms and waivers with the ability to sign online. Optionally add on LUNCH, and extended care programs. Hyperlink the camp names for pop-up descriptions for each camp. Customized email confirmations in HTML or plain text, with optional PDF attachments. Custom and Standard reports, (e.g. enrolment, attendance, ad hoc). Centralized medical records, (option to update current medical conditions upon each new registration). Email blasting to last year’s campers with MailChimp or equivalent. Top quality yacht and sailing registration software/ systems. High Speed Change editor for cancelling or switching to new programs. Backups run 4x / day. Crowd control for rush periods. Register on a mobile device. Accepts all sorts of payments. Accept deposits then full payments at a later date. The e-RegisterNow ASP service works for camps located in both Canada and the USA. It’s a cloud based service which is solely accessed by your web browser. There is no local software to install and no updates to perform. Your data is secure, fully owned by you, and compliant with the PCI standard. Social media integrated into the registration process can dramatically help grow your yacht and sailing registration enrollment. Check out the movie at InGo.me. InGo and e-RegisterNow have a social media plug in which is optional, but has shown to be effective at growing your sailing summer camp enrollment by leveraging the help from your already existing parents and campers. Continue using your current ‘VISA/ MC/ AMEX’ merchant account on our systems. Our finance team works to connect your already existing VISA/MC/AMEX merchant accounts to the e-RegisterNow camp registration software. The finance team is also in a position to recommend, if it thinks you’d benefit from lower merchant rates. Access your own Dashboard. Manage all events, registrants, coupons & more! You will have access to your very own Dashboard, through our login portal. Allowing you to have full reign and control over your camp and event registrations. e-RegisterNow provides you with tools for handling any problem that may come your way. From controlling and monitoring user access, to refunding and redeeming tickets, making it one of the best sailing club management systems. Customize-able Email confirmations (with PDF attachments). Let all your online event registrants be ‘in the know’, with fully customize-able e-mail confirmations. Allowing you to ensure your registrants/ attendees receive the tickets and important information they need; without compromising the aesthetic of your club registration process and brand. View financial & registrant reports. Make your own custom reports. We are masters of raw data. We give you the complete rundown of everything that happens on the event registration page from your guests first click right down to their very last. Better than our competitors we are known for our ability to NEVER say no, if you can think of a problem chances are we already have a solution for you. 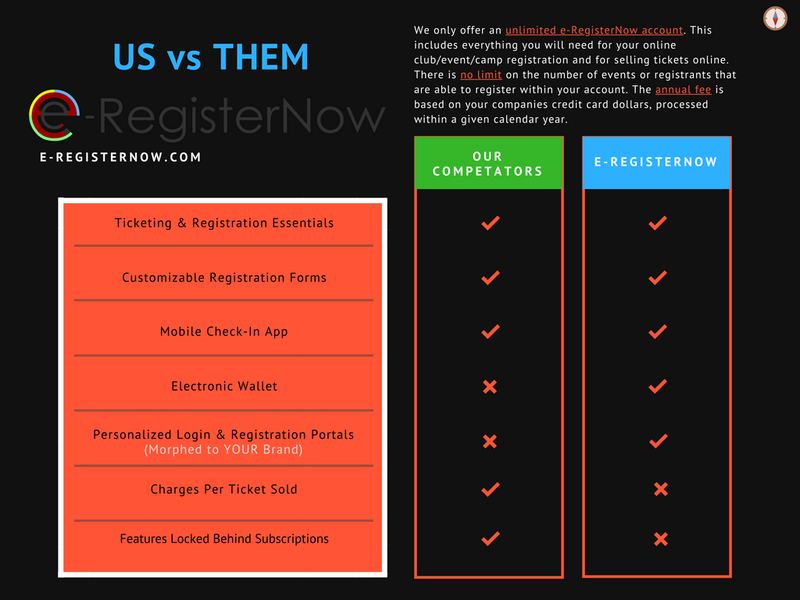 Look below to see how e-RegisterNow compares to other online camp/ event registration software & ticketing companies. We are constantly adapting and improving and so should you. Join now and let e-RegisterNow be your one and only; best online event registration software. And find out why everybody is changing to e-RegisterNow today! So give us a call at (1-800-218-1020) or sign up for our Mailchimp and book a free demo. We’d love to hear from you!